Petrified ear is an uncommon condition, usually asymptomatic, whether by calcification or ossification, results in a rigid and immalleable ear. In cases of extreme discomfort, surgical intervention like conchal reduction through a posterior incision has been employed. Petrification of the auricle, whether by calcification, ossification, or otherwise, is an uncommon condition, results in a rigid and immalleable ear. Ectopic calcification represents an usual cause of a petrified ear. It occurs through deposition of calcium and phosphorus in a proteinaceous matrix as hydroxyapatite crystals, and by definition it occurs in soft tissue, which does not normally ossify. Radiographically, it demonstrates the same opacity as thenormal bone, and it is histologically similar to the lamellar bone found elsewhere in the body. A 47-year-old male presented to our OPD with blocking sensation in both ears for 6 months duration. His other complaint was mild discomfort during sleeping on sides. No history of trauma, ear discharge, ear pain, itching, and tinnitus. The patient could not recall any familial occurrence of auricular rigidity. 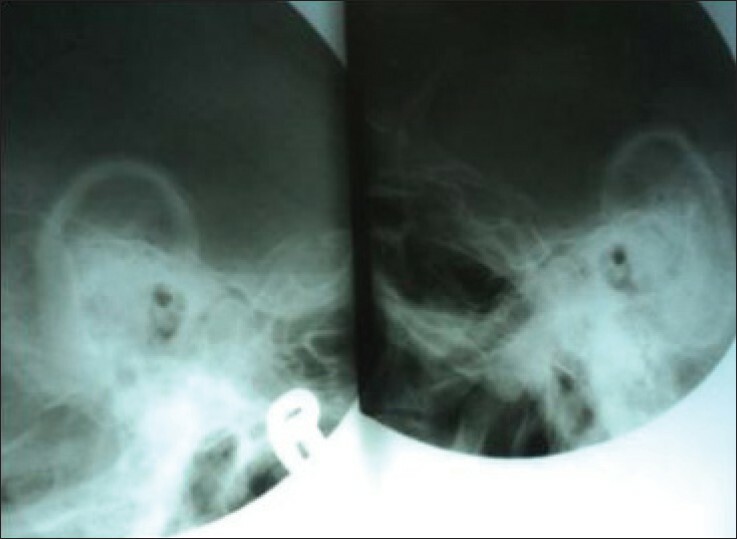 Routine ENT examination demonstrated a bilateral rigidity [Figure 1] of both auricles, which were completely inflexible except of the lobule. The rest of the auricles configuration and skin appearance were normal without noticeable cutaneous abnormalities. The external auditory canal and tympanic membrane were found normal. Palpation of nasal, thyroid and cricoid cartilages did not reveal any abnormalities and the epiglottis and arytenoids had a normal appearance on laryngoscopy. Pure-tone audiogram reveals a mild degree of sensorineural hearing loss. X-ray both mastoids, Law's view revealed opacities [Figure 2] consistent with the bony structure in the auricle of the ear. The results of laboratory testings, including complete hemogram, biochemistry, serum calcium, and phosphorus levels and electrolytes were within normal limits. Patient is a known case of hyperthyroidism and hypertension for past 10-15 years and on regular treatment. The systemic illness most often related with calcification of auricular cartilage is suprarenal insufficiency. One of the aetiological hypotheses posed is that the acute or chronic shortage of cortisol may produce a long-lasting or transient hypercalcaemia that favors the deposits of calcium in tissues. Addison's disease is the most common endocrinopathy associated with this condition while hypopituitarism, diabetes mellitus, acromegaly, and hypothyroidism have also been reported. Calcification of the auricular cartilage was first recognized as early as 1866 by Bochdalek. Although it seems that the disease is infrequently seen in clinical practice, the true incidence of the condition is a matter of controversy. In 1932, Scherrer  examined 800 apparently healthy patients, aged between 15 and 75 years and no evidence of calcification was documented. In 1963, in a randomized study of a series of 300 patients, Gordon  examined for inflexibility of the ears. He found radiological evidence of calcification of the ear cartilage in 11 patients (3%). More recently, in 1998, Bowers and Gould reported that auricular calcification is found more frequently in older people, especially those who have worked outdoors. These authors concluded that the disease is not, in fact, rare. Severe hypothermia has been considered as the most common cause of auricular ossificans. Rapid cooling has been suggested that can produce vascular thrombosis and occlusion and consequently the resulting ischemia can induce lamellar bone proliferation. Ossification involves new bone development histologically resembling the trabecular bone. Ectopic ossification  of the auricle (auricular occificans) involves bone formation by the deposition of calcium and phosphorus in a proteinaceous matrix as hydroxyapatite crystals in a tissue that normally does not ossify. The limited cutaneous form of systemic sclerosis scleroderma is often referred to as the CREST syndrome. "CREST"  is an acronym for the five main features: calcinosis, Raynaud's syndrome, esophageal dysmotility, sclerodactyly, telangiectasia. "Keutel syndrome"  is a rare autosomal recessive genetic disorder characterized by abnormal diffuse cartilage calcification, hypoplasia of the mid-face, peripheral pulmonary stenosis, hearing loss, short distal phalanges (tips) of the fingers and mild mental retardation. X-ray usually demonstrates opacity similar to that of a normal bone. Histologic sections of the auricle demonstrated spicules of the lamellar bone with cement lines and osteocytes, stromal component of adipose tissue, and fragments of elastic cartilage, and woven bone. The osteoblastic activity was not prominent. Because most cases are asymptomatic, there are no guidelines for treatment of this condition. An improvement has been reported after conchal reduction by surgery. Our patient's complaint was only a mild discomfort when sleeping; thus, he denied any surgical intervention. True auricular ossification is a quite rare clinical entity with unclear pathogenesis and one should have in mind that there is always the possibility of a serious co-existed disease like endocrinopathy. Petrified ear is usually asymptomatic. Radiographs demonstrated opacities consistent with ossification and true bone formation in both auricular cartilages. In cases of extreme discomfort, surgical intervention like conchal reduction through a posterior incision has been employed. 1. High WA, Larson MJ, Hoang MP. 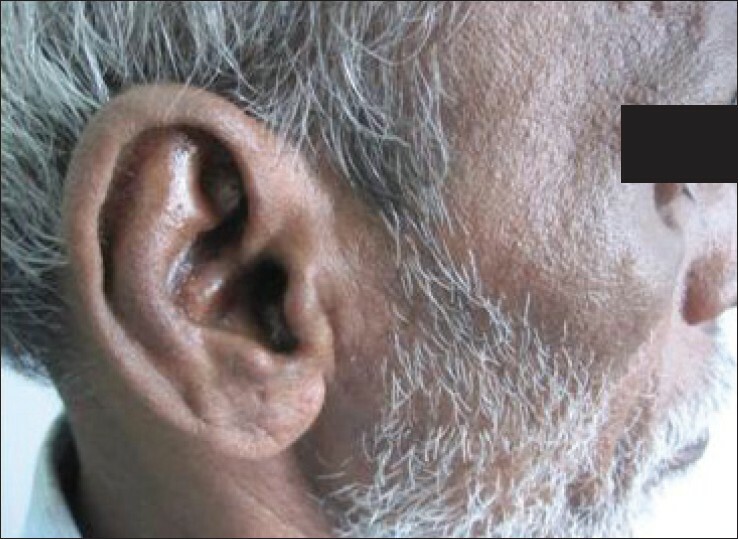 Idiopathic bilateral auricular ossificans: A Case Report and Review of the Literature. Arch Pathol Lab Med 2004;128:1432-4. 2. Mastronikolis NS, Zampakis P, Kalogeropoulou C, Stathas T, Siabi V, Geropoulou E, et al. Bilateral ossification of the auricles: An unusual entity and review of the literature. Head Face Med 2009;5:17. 3. Bochdalek G. Psysiologische Verkno cherung der Aurecula. 1866;89:33-46. 4. Scherrer F. Calcification and ossification of the external ears. Ann Otol 1932;41:867-85. 5. Gordon D. Calcification of auricular cartilage. Arch Intern Med 1964;112:73-7. 6. DiBartolomeo JR. The petrified auricle: Comments on ossification, calcification and exostoses of the external ear. Laryngoscope 1985;95:566-76. 7. Winterbauer RH. Multiple telangiectasia, Raynaud'S phenomenon, sclerodactyly, and subcutanious calcinosis: A syndrome mimicking hereditary hemorrhagic telangiectasia. Bull Johns Hopkins Hosp 1964;114:361-83. 8. Munroe PB, Olgunturk RO, Fryns JP, Van Maldergem L, Ziereisen F, Yuksel B, et al. Mutations in the gene encoding the human matrix Gla protein cause Keutel syndrome. Nat Genet 1999;21:142-4.